Cabin bedding isn't only for cabins! Create a "down-home" atmosphere in any bedroom anywhere with relaxing and inviting cabin bedding and bedding sets. Whether you have a lodge in the woods, a beach house, a country vacation home, or you want to bring warmth and interest to your bedrooms at home, cabin bedding is the perfect choice! 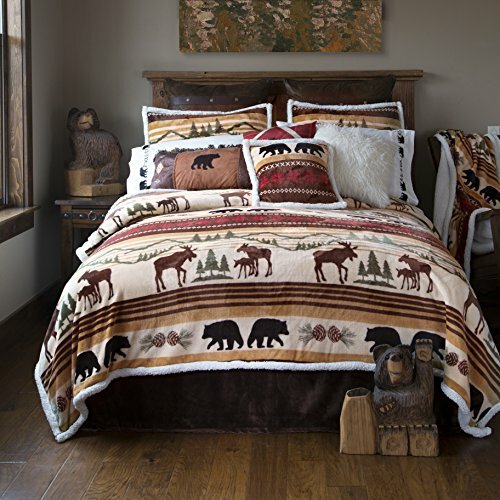 Cabin bedding designs might include wildlife such as moose, bears, fish, etc, or Aztec designs featuring warm colors. You might choose patchwork quilts, suede comforters, or Western designs. 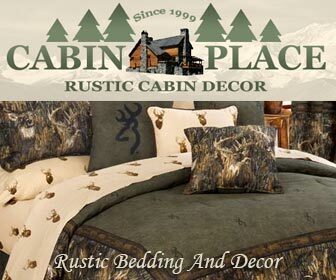 You really can't go wrong with any cabin bedding design you decide to use. Create a relaxing lodge feel, or please the wildlife enthusiasts in your home with these cool bedding designs. Add other touches to your bedroom such as antler lamps, baskets, iron wall decor, cowboy figurines, braided rugs, or anything else you desire, in order to create a themed bedroom you'll absolutely adore. Look at this Black Forest Decor exclusive! 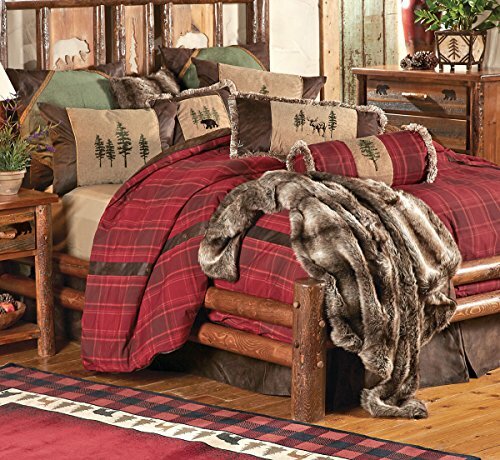 Create a classic cabin look with the Highlands Cabin King Bed Set featuring woven red plaid complemented by embroidered tan chenille, riveted faux leather and olive and chocolate microfiber suede. These rustic bedding sets include the comforter, bedskirt, two shams, and one neckroll. Dry clean. The warm colors in this design will have you sleeping comfortably every night. ​Traverse the far-off foothills of the hinterland! this bedroom collection is the very picture of Peace, as lichen green, warm red, and shades of earthen brown combine as nature's perfect palette. Stately moose and lumbering bear claim ownership to the Uncharted wilds of earth and pine. The polyester plush comforter, lined with a luxurious faux shearling, is as soft as a Whispering breeze. Choose from a variety of coordinating shams and pillows, and stake your claim in the hinterland. The cabin bedding below will add a glow of warmth and comfort to any bedroom. Choose from a beautiful variety of designs and colors. ​You can create any type of atmosphere you desire, and it all begins with your bedding. 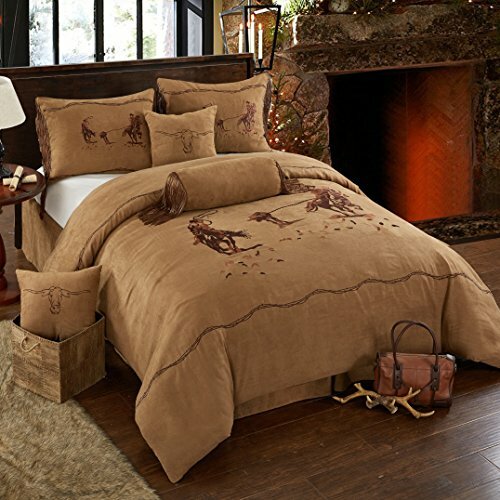 This luxury cowboy western design comforter features a beautifully embroidered cowboy horse rider over a rich brown micro suede. To complement the set, two square cushions with a gorgeous embroidered bull and a highly decorated neck roll are included. Available in 3 sizes, and along with the 2 square pillows and neck roll, you'll get a matching bedskirt and shams, too! 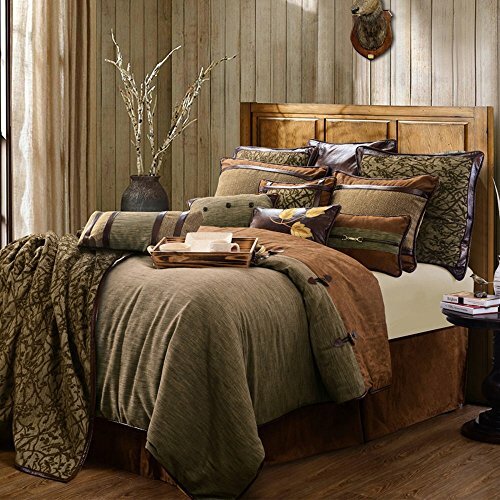 Rustic designs make these cabin bedding sets attractive, warm, and luxurious. You'll enjoy them in every bedroom of your home, or use them in your cabin or beach cottage, too. 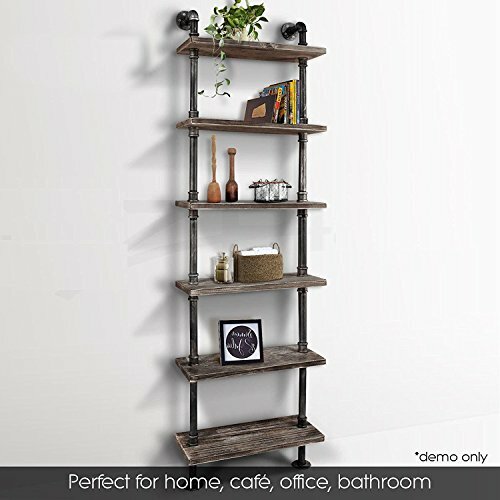 Use this rustic shelf for books, nic-nacs, clothing, or more. It will not only add decor to your cabin-themed bedroom, but is useful, too. Four cast resin antlers intertwine to form the base of this stunning Faux Antler Table Lamp, while a tan faux suede shade tops it off for a truly rustic feeling. This antler decor uses a 60-watt max bulb. Lamp: 29½" H; Shade: 7" x 18" x 12". 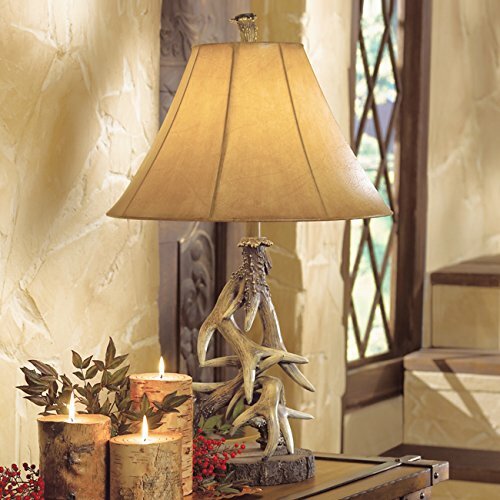 Light your rustic bedroom with this cool antler lamp. A perfect addition to any cabin bedroom. The cabin bedroom decor featured below will go well with your cabin bedding. ​When adding accessories to your bedroom, consider wall decor, rugs, lamps and other lighting, tabletop decor, and more. The cabin bedding below is stylish and made of quality fabrics. You'll love the designs and look that this bedding offers. Whether redecorating your home bedrooms, or adding style to your cabin or lodge, this cabin bedding is just what you need to create a magnificent bedroom.